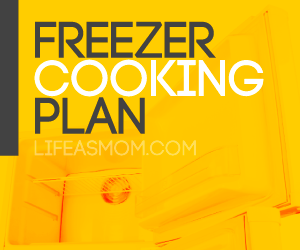 Each month on Life as MOM, I share a freezer cooking plan that you can download and cook from. Grocery list is included. This month’s plan is suited for Cold Weather and Company Dinners. I FINALLY got a copy of your book from the library…it is worth EVERY penny! You cook exactly like I do! @Andrea, so great to hear! Um…. enjoy the snow day? I couldn’t use any of the links. They all gave me error messages. Any reason why? @NIA, we had some site issues. Everything should be operational at the moment. Link for the cooking plan didn’t work for me, either. Not that I could use it right now, my freezer is PACKED! 🙂 I found some awesome deals on lots of meat today… good problem to have though right?? @Brandi, Also, I think I’m addicted to your wholesome energy bars! Toasted with butter… Mmm! @Brandi, you’re good to go now. I am addicted to the energy bars, too. We can’t keep them in the house. They disappear too quickly. Thank you so much for taking the time to create these cooking plans!!!! I look forward to more (hint, hint.) I have your book and love it as much as I do your blogs. I saw your book for sale in Wegmans. It’s a very nice grocery store in the northeast. @Christine, you’re welcome. Thanks for the kind words. I plan to do them monthly until we get a good assortment to choose from. I think between the book and the posted ones, we’re at 14 different plans. How fun to find the book in a grocery store!